As discussed elsewhere, Edinburgh’s World Christianity students have been working to bring what they are learning in their courses out into the wider world through Wikipedia. The University’s Wikimedian in Resident Ewan McAndrew interviewed Dr Alexander Chow1 and two students, Lucy Schouten and Nuam Hatsaw,2 about their experiences. The massive online encyclopedia grows at an average rate of 800 articles per day, but in 2016, at least 25 of those began here in New College, Edinburgh. A new but growing field, World Christianity thrives upon the continuous challenge of disseminating scholarship from small to growing institutions from Beijing to Botswana. Through a series of Wikipedia projects conducted during Fall 2016, the Centre for the Study of World Christianity and the School of Divinity in the University of Edinburgh have experimented with a new platform for disseminating information quickly in a rapidly changing field. 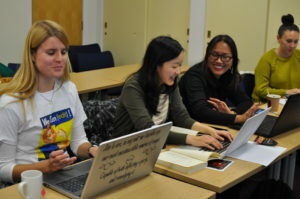 Women-and-Relgion-Edit-a-thon at New College. Photo by Dr Alexander Chow.